Fiberglass failure. 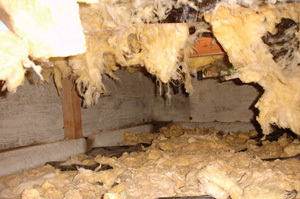 Fiberglass batts don’t perform well when installed between ceiling joists in a basement or crawl space. They can absorb moisture, compress, lose R-value and eventually fall out of place. Don’t put up with a basement that’s too damp, too cold and too uncomfortable to be of much use. Basement insulation can solve all these problems. But it’s important to install the right kind of insulation, in the right location and in the right way. Your local Tri-County Insulation & Acoustical contractor can inspect your home and help you decide on the best insulation solutions for your basement. 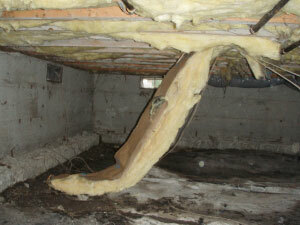 It’s a common misconception that fiberglass installed between basement ceiling joists counts as basement insulation. It doesn’t. Basement ceiling insulation is actually insulating the space above the basement, not the basement itself. Fiberglass batts really shouldn’t be used anywhere in the basement, because of numerous problems. Permanent solution. 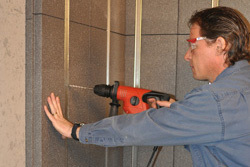 Rigid foam insulation can be installed against foundation walls with adhesive and masonry fasteners. One-step solution.ThermalDry™ Decking combines rigid foam floor insulation with moisture-proof & mold-proof subflooring. Unlike fiberglass batts, rigid foam insulation won’t absorb moisture, compress, lose R-value or fall out of place. It’s got ideal characteristics for use in the basement, which is why we recommend two innovative basement insulation products:SilverGlo™ basement wall insulation and ThermalDry™ insulated subfloor panels. Putting rigid foam insulation on basement walls will make your basement and your entire house more comfortable and more energy efficient. SilverGlo™ panels are made with tiny graphite particles that reflect heat and provide superior R-value. The rigid foam panels also boast a radiant barrier, which reflects heat back into your basement. For maximum energy savings and comfort, it’s best to insulate both the walls and floors of your basement. If you plan to install finished flooring when remodeling the basement, it’s smart to install ThermalDry™ Insulated Floor Decking™ first. These interlocking, 2-ft. X 2-ft. squares combine rigid foam insulation and special moisture-proof underlayment. 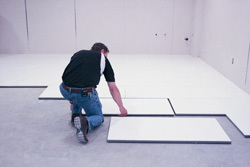 You install basement floor insulation and subflooring in one step – a great start for the finished floor of your choice. Tri-County Insulation air sealed and insulated the cold crawl space walls with the revolutionary SilverGlo™ foam board insulation. The rim joists were insulated with spray foam insulation. The crawl space vent was also closed and air sealed. Insulation plays a vital role in a home’s comfort and energy efficiency. But in order to do its job, the insulation used in your home should meet three requirements: 1) the right kind of insulation; 2) the right amount of insulation; 3) the right installation technique. 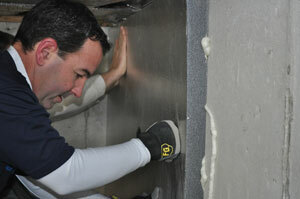 Air sealing the crawl space to improve comfort and energy efficiency. Insulating crawl space walls with high-performancerigid foam insulation. Sealing crawl space vents and openings for improved comfort and energy performance. Fiberglass is wrong. Batts installed between joists in a crawl space absorb moisture, lose R-value, and often fall out of place, as shown above. It’s unfortunate but true. Builders often omit crawl space insulation or install the wrong type of insulation. In either case, this error causes a house to be uncomfortably cold or hot at different times of the year, and more expensive to heat and cool. A poorly insulated crawl space is also likely to be excessively damp, encouraging the growth of mold and wood rot. The old-fashioned way to insulate a crawl space was to install fiberglass batts between the overhead joists in the crawl space. This is no longer recommended for several reasons. In a crawl space, fiberglass insulation tends to absorb moisture, which causes it to lose R-value and fall out of place, rendering it totally ineffective while also creating a mess (see photo). Installed against foundation walls, rigid foam insulation won’t lose R-value, fall out of place or be damaged by moisture. Fortunately, there’s a type of insulation that can perform well in crawl space conditions. Unlike fiberglass insulation, rigid foam insulation won’t absorb moisture, lose R-value or encourage mold growth. It won’t compress or fall out of place either. In crawl spaces (and basements, too), rigid foam insulation is usually installed against the foundation wall. By changing the location of the insulation, the crawl space can be brought inside the building envelope, which improves overall home energy performance. Don’t put up with low comfort and high utility costs caused by poor crawl space insulation. Call Tri-County Insulation for a free crawl space insulation estimate. We install the right insulation in the right way, so that your home can be more comfortable and more energy efficient.